The Berlin Wall comes tumbling down amid masses of people in November of 1989, 25 years ago. It changed the course of history forever, and truly was the end of the Cold War. It played a big part in the fall of Communism in Eastern Europe, and led to the reunification of Germany less than a year later. 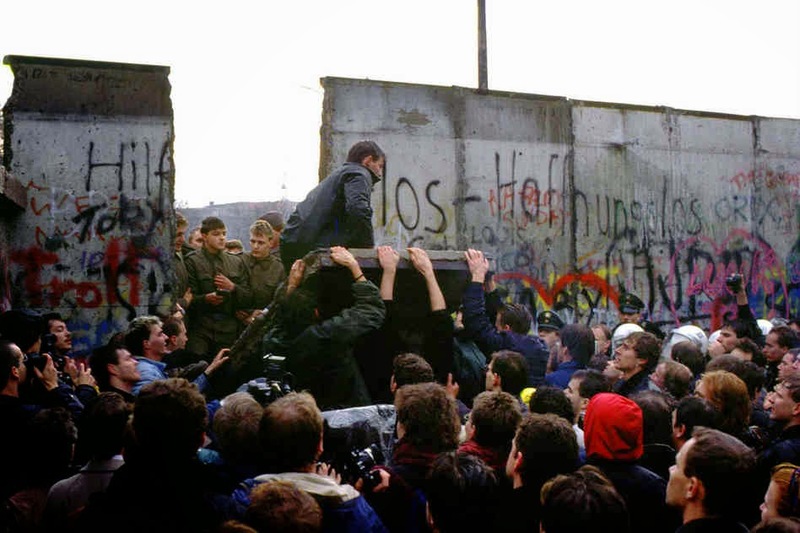 On Nov. 9 the world celebrated the 25th anniversary of the fall of the Berlin Wall, and I recall exactly where I was when I heard the news. It’s funny. When I was growing up, I heard a lot about Germany and Berlin being divided into East and West. I later discovered I was not the only one who thought that meant Berlin was right in the middle, and the partition line (I refuse to use the word border) that went through the country went through Berlin. Only later, in high school, did I discover that Berlin was located completely inside East Germany, and partitioned there. That was the only way the Soviets could have created their infamous blockade in 1948. The year 1989 would go down in history as one of the most eventful years of the decade. Not only did the Ayatollah Khomeini die in Iran, and student protesters put Tiananmen Square on the map in China, but freedom began to blossom in Eastern Europe. By the fall, there seemed to be another major event every day somewhere in the Soviet Bloc, whether it was agitation in Poland, the Velvet Revolution in Czechoslovakia, or the coup that led to the execution of Romanian dictator Nicolae Ceaucescu. Amid all that, things began to foment in East Germany. Back then I was not as immersed or intrigued by my German roots as I am now. Mind you, I was only 19 years old at the time. Still, anyone who grew up in a German family like I did, that came to Canada seeking a better life, held out hope that one day the Communists would be gone. One day, the two parts of Germany would become one again. My mother always said it would all change if the right man became leader of the Soviet Union. As in so may other things, she was right. Mikhail Gorbachev became leader of the Soviet Union a few years earlier and began to implement reforms. Whether it was increased openness through Glasnost, or the restructuring of trade with Perestroika, he was changing the Soviet Union. That change would soon spread to the Soviet satellites in Eastern Europe, and one by one they began to assert greater and greater degrees of freedom and independence. Finally, in the fall of 1989, I was lying on my bed in my room on Main Kelsey, dozing after another long Edmonton day. Suddenly the phone rang. It was my friend Kevan, who I had begun to hang out with regularly at the start of the school year. “I thought you’d be dancing in the streets,” he said. “What do you mean?” I asked. I had no clue what he was talking about. “Didn’t you hear?” he asked. I had not. I could not believe what he was saying. You have to understand, growing up in the Cold War 1980s, there was this sense the Soviet Union would last forever. There would never be peace, or freedom in the Communist countries. Instead, Communism would reign there forever, and the best we could all do was keep it from spreading. I hung up and went in to the lounge. Some of my floormates were huddled around the TV, watching the coverage from Berlin. The wall, the symbol of a divided Europe, was coming down. People were actually tearing it down piece by piece. The next time I spoke with my mother, the following Sunday (when the long-distance phone rates were the cheapest), she really could not believe it either. Yet, it had happened. Her hopes of a strong leader freeing the people of the Soviet Bloc, had been realized. It is hard to believe it has been 25 years since the fall of the Berlin Wall. One of my overriding memories of that period is not so much the event itself, but the fact I was so immersed in my own world, I did not pay near enough attention or respect. Looking back, it was just over a year after the death of my grandfather. He would have loved to see the wall fall. But that thought never entered my mind until just recently. Only a year later, in the fall of 1990, when I took a German history course as my last option before I went student teaching, did I begin to understand what had happened. It was an amazing time and, looking back 25 years later, changed the world forever.